Classic Army is a leading manufacturer of Airsoft products, setting standards for the entire industry. This model of the Nemesis Delta Gen 1 will ship directly from the manufacturing center. Additionally, Nemesis Delta Gen 1 is priced lower since the product is coming from Hong Kong! This is literally one of the best deals on Earth considering the package can ship to any country where its legal. It's time to get your hands on this affordable deal coming straight out of the factory! Whether you are a raw beginner or a seasoned veteran, the Classic Army Nemesis series of AEGs was designed to give players the ultimate tool to take down the enemy. Classic Army took the best parts of its Scarab line and molded these innovative features into your enemies' worst nightmare. At the same time, you have the easy accessibility of the Picatinny rail sections included in the box. That and many other features make the Nemesis Delta Elite Carbine AEG Airsoft Gun w/ Modstock from Airsoft GI perfect for customization and close-quarters to mid-range fighting. Externally, the upper and lower receivers are metal, giving you a super-aggressive billet-style look and ensuring that both receivers match up exactly. The handguard was custom designed in-house by members of Classic Army USA, and toward the back you will see an adjustable modstock. Internally, the gun has a 9mm bearing bushing gearbox, a brand-new electronic control system, or ECS, 6.03mm tight-bore barrel and a TRUE quick-change spring system. The ECS protects your trigger contacts and has a trigger-programmable three- or five-round burst fire function. One magazine is included with each Nemesis Delta Elite M4. Each magazine will hold 300 rounds, providing plenty of ammo. This gun will shoot 375-400 fps using 0.20g BBs and 900-1000 rpm using a 7.4V battery. It has a true quick-change spring system you can access without having to take out the gear box, so you can quickly and easily upgrade or downgrade your spring to change the power level. An experienced player states that the Nemesis Delta Elite Carbine AEG is a versatile airsoft rifle capable of handling a multitude of play styles. It has fantastic internal upgrades to facilitate this versatility as well. The ECS trigger provides absurdly fast trigger response, beating out the vast majority of guns on the market, from trigger break to rounds fired. Its tight-bore barrel improves accuracy, which every player wants no matter the style of play, and its high-torque motor helps keep the rate of fire high in those extreme situations when you need to use this for more than one or two shots at a time. The Nemesis Delta Elite M4 uses Classic Army's definitely nontraditional but undeniably comfortable Delta series handguard. First made popular on the company's nylon guns, it is now made with the same metals as the rest of the Nemesis line. This free-float style rail utilizes two different modular systems to give you an insane level of customization. If you need a vertical grip to maneuver around the field, the KeyMod slots on the bottom allow you to mount one directly on the gun. Or you can utilize a Picatinny rail piece, depending on the grip you prefer. Its side panels are smooth but allow you to screw in some included Picatinny segments to mount lights, lasers, hand stops or other accessories. The Delta handguard also includes some lightening cuts and some divots to place your fingers in, making sure you stay comfortable on the field in any situation. That means you can play at your peak for as long as it takes to vanquish the opposition. The Nemesis Delta Elite M4 offers outstanding versatility, making it suitable for a variety of applications and extending its value with its adaptability to different styles of play. 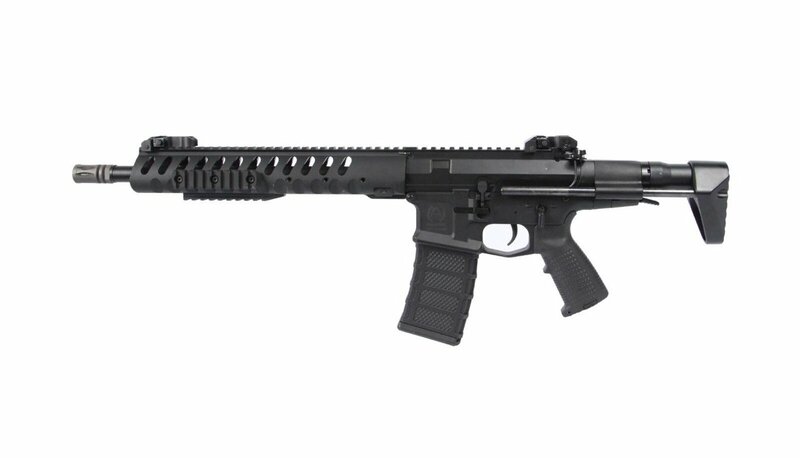 Because of its carbine size, a simple spring swap makes this gun perfect for a CQB-only field. But its collapsing stock allows you to shrink it down for storage or for MOUT play too. This is the perfect-sized gun to run without optics, but when you need to be quick and precise, a red dot looks great and provides the functionality you'll need to make this gun an absolute monster on whatever field you want to take it to. what type of battery is best with this gun? Is the outer barrel thread CW or CWW and what is the size mm? What size barrel come with this gun. 6.10mm, 6.01mm or other? Also what material is it made out of? Brass, Aluminum or Stainles Steel? How fast does this shoot?